WoodTalk – This is a fun, lighthearted weekly podcast featuring Marc Spagnuolo (The Wood Whisperer), Shannon Rogers (The Renaissance Woodworker), and Matt Cremona. They discuss what they’re working on each week and answer listener mails and questions. Episodes are about 45 to 60 minutes long. Shop Talk Live – Like WoodTalk, this is also a pretty lighthearted show, though it tends to be a little more focused. This podcast is hosted by several editors of Fine Woodworking magazine. It has regular features where the editors discuss projects that have inspired them, or tools or techniques that have worked well for them recently. Episodes are about an hour long. The Renaissance Woodworker – Shannon Rogers, mentioned above with WoodTalk, maintains an excellent series of weekly videos on YouTube. He’s a hand tool woodworker, so I watch all of his videos with interest. He likes to experiment with new tools, and is also frequently improving his shop. He also works in a lumber yard and is able to give insight into the business side of lumber yards. Definitely one of my favorite woodworking personalities. Paul Sellers – Paul Sellers is an experienced professional woodworker and posts mostly-weekly videos demonstrating basic woodworking techniques. I’ve somewhat fallen off his videos lately, since I find they’re often targeted at people brand new to woodworking and I sometimes disagree with his choices. But I think he’s an excellent place to begin getting familiar with the craft due to the breadth and depth of basic woodworking knowledge available in his videos. His enthusiasm is infectious and he makes woodworking seem really easy, perhaps even misleadingly so. Rob Cosman – Rob Cosman posts great, in-depth videos about his current projects, and sometimes more general videos about techniques. Updates sporadically, but I always enjoy his videos. Popular Woodworking Magazine Blogs – PWM has a number of different blogs, all of them worth subscribing to. Chris Schwarz posts great, down-to-earth articles about once a week. Megan Fitzpatrick, PWM’s editor and director, often posts about running the magazine and other woodworking community aspects. Other PWM authors contribute a few articles on various techniques each week. Sometimes they run older articles from the magazine itself. Lost Art Press Blog – Chris Schwarz maintains a blog for his publishing company where he posts about upcoming projects, his travel experiences, and techniques he’s experimenting with. Sometimes his articles here and on PWM blog seem like first drafts of articles that end up in PWM or in his books. Published authors also frequently contribute to the Lost Art Press blogs. Lately they’ve been running a fascinating series of profiles of Lost Art Press authors. I also like the Walk in the Woods articles from Steve Schafer about plant identification in the wild. Fine Woodworking Magazine Blog – The Fine Woodworking magazine authors post a few blog articles per week, usually focusing on a specific technique. Like the magazine, which I discuss below, these tend to focus more on power tools than hand tools, which means I end up skipping most of them. But it’s low volume, so I am keeping up with it for now. 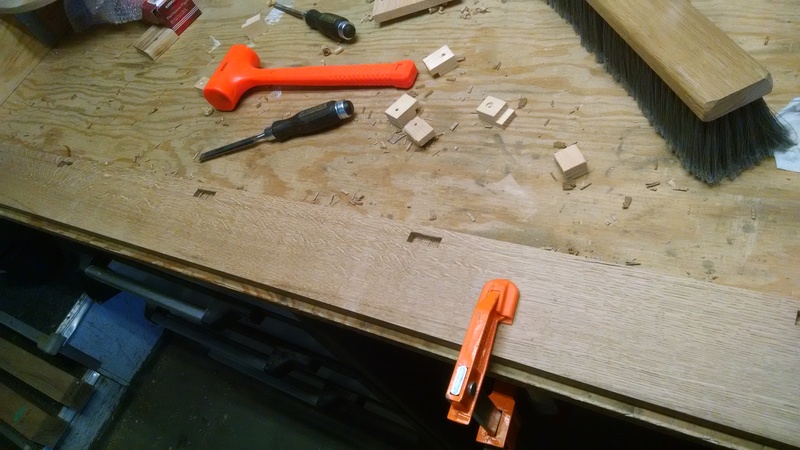 The Something Awful Forums Woodworking Thread – This isn’t a blog per se, but people on the SA forums post their completed projects, in-progress updates, and questions here for discussion. It’s quite active, usually receiving at least a few posts every day. Popular Woodworking – This is my favorite woodworking magazine. It shows up about six times per year and I’m always sad that I can blaze through it in just a day or two of commuting to work. My favorite parts of the magazine cover techniques, tools, or hardware, with about an even split between hand and power tool usage. I’m less interested in the in-depth plans and project walkthroughs. The magazine also often has craftsperson or shop profiles, which are fun to read. 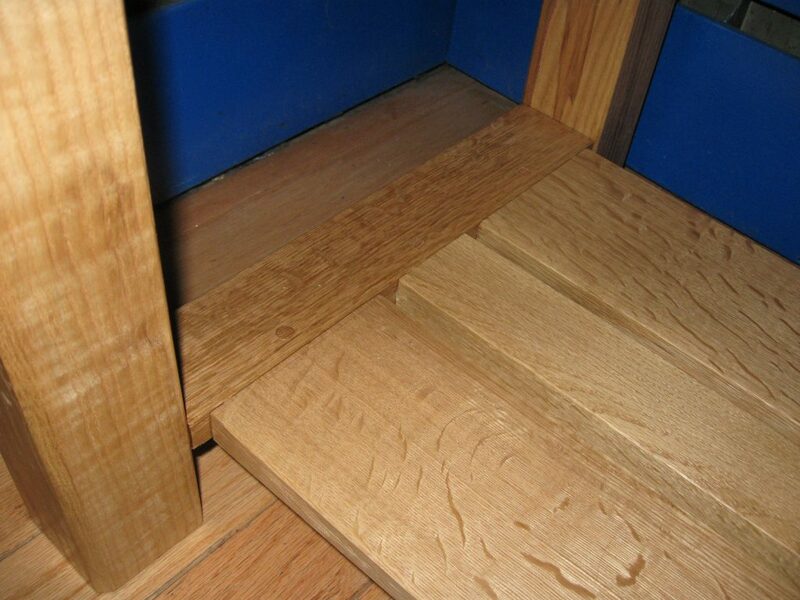 Mortise and Tenon – This is actually halfway between a magazine and a book. It’s a once-yearly periodical sold for $20 plus shipping. Only two issues have been published so far. But they’re both excellent to read. The focus is strongly on pre-industrial woodworking. Some of my favorite articles in each issue are examinations of pieces from a couple hundred years ago, including internal construction details, tool marks, that kind of thing. The second issue had a great feature about reconstructing the history of a bed built in America that somehow turned up in England. 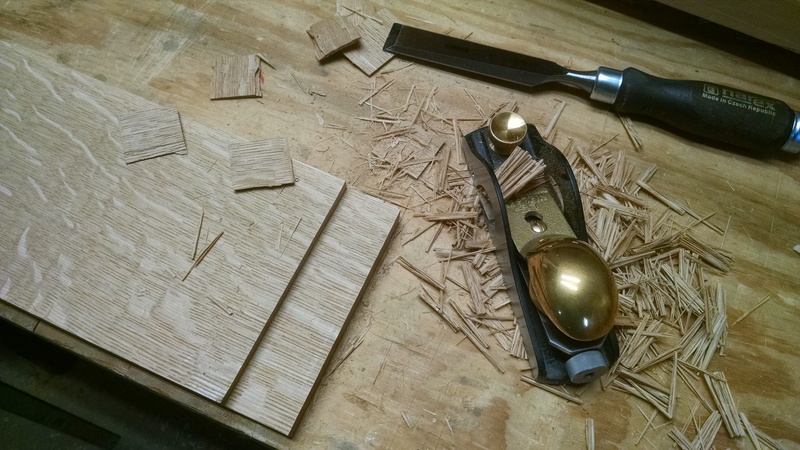 Fine Woodworking – I’m less enamored with Fine Woodworking. It seems to focus largely on project plans, and definitely has a strong preference for power tools. It feels somewhat more focused towards the professional or working woodworker as opposed to the amateur. That said, I’ll probably keep my subscription as I already read my woodworking sources faster than they can write them. I also really enjoy their Shop Talk Live podcast, mentioned above, and this is a way to financially support it, albeit indirectly. The Complete Illustrated Guide to Joinery by Gary Rogowski – This excellent book just contains a long list of joinery options for every scenario. When I’m designing a project, I review this book to recall my joinery options. It contains full color photographs for how to construct every joint with a variety of tools, from hand tools only to a complete power tool shop. The Complete Illustrated Guide to Furniture & Cabinet Construction by Andy Rae – This book discusses the basics of frame construction, especially discussing how to build durable furniture and account for wood movement. The first chapters are a great overview of how to build durable furniture, before moving on to design details and specific examples of case construction like drawers, hinges and doors, case feet and trim. Like the previous book, I use this as a reference when designing a new piece. The Essential Woodworker by Robert Wearing – I highly recommend this book. 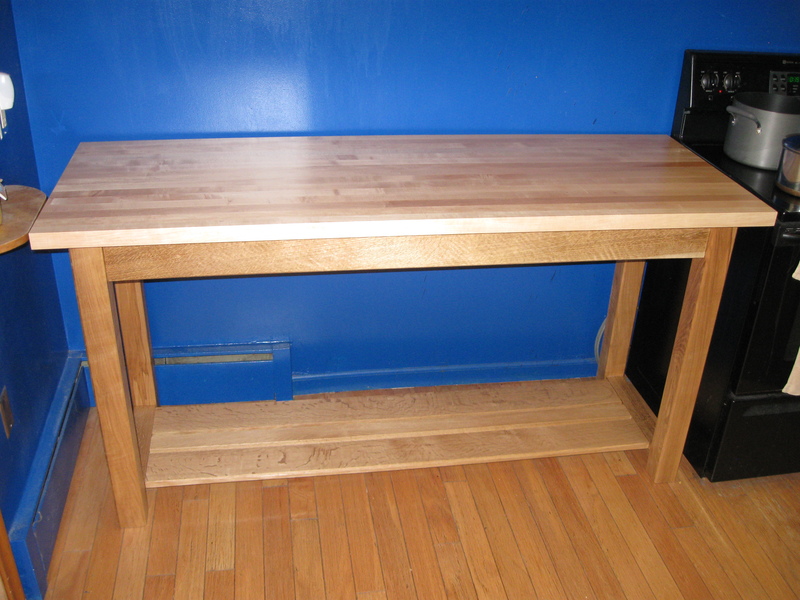 It’s a brief introduction to every woodworking skill needed for simple furniture construction. If you want to know how to dress your stock, put together a table, or construct a box, this book will tell you how to do it with no fluff. This book will make you conversant in furniture construction, giving you a base of knowledge you can use to understand other resources. Understanding Wood Finishing by Bob Flexner – I hate finishing, but this book helps make the task less daunting by getting right down into the nitty gritty for how each kind of finish actually works at the chemical level. This gives you the information you need to decide what finish, or combination of finishes, will give you the effects you want. I haven’t finished enough projects to have made much use of this yet, but at least I have a basic understanding of finishes from reading this book. Again, when it comes time to select and apply a finish, I use this book for reference. The Anarchist’s Design Book by Chris Schwarz – I like this book so much, I actually have read it cover to cover twice and haven’t yet built anything from it (though I plan to do so shortly). 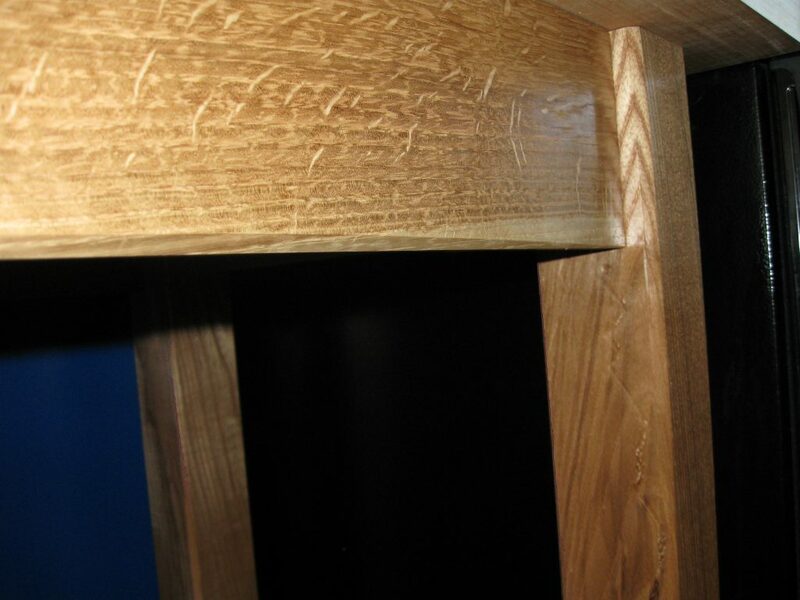 It’s impressive the variety of high quality furniture can be built with the book’s key joint, the back-wedged, staked mortise and tenon. Chris’s writing is always a joy to read. Chapters scattered here and there describe his design philosophy or cover finishing techniques including an excellent two-page primer on milk paint and a short treatise on a soap finish which I’m eager to try. Workbenches: From Design & Theory to Construction & Use by Chris Schwarz – If you’re interested in designing your own workbench, I expect this is a good resource. I read it cover to cover, because I enjoy Chris’s writing, but frankly you could probably get by without this book if you simply want to build one of his workbench designs. He’s shown them off on his blog and in videos around the web often enough that they’re dead simple to clone. 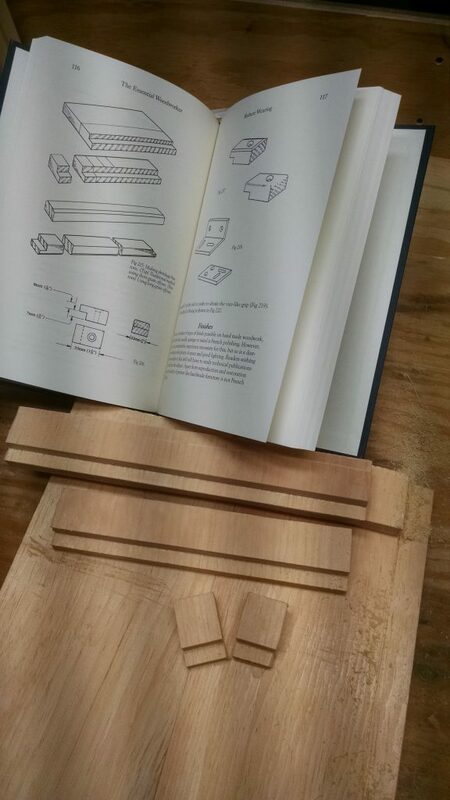 I built my knockdown Nicholson bench using the instructions in this book, but his blog posts on the subject really were sufficient that I could have skipped the book. I finished the second of the two projects that got me into woodworking this week (the first was a coat rack). This is a new table for our kitchen, which will give us about six more feet of countertop space. This project had a lot of firsts for me. This was actually my first time working with rough cut lumber. I’d been wanting to do that for a long while, learning how to buy from lumber yards really opens up a lot of options. 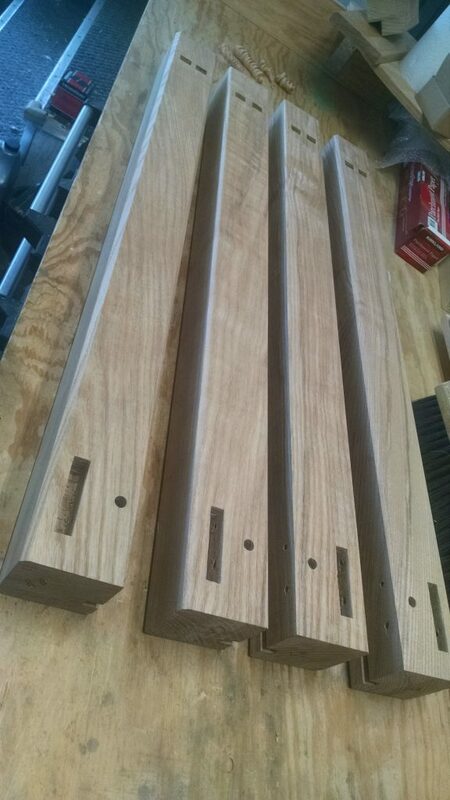 The frame is all quartersawn white oak and the legs are ash. 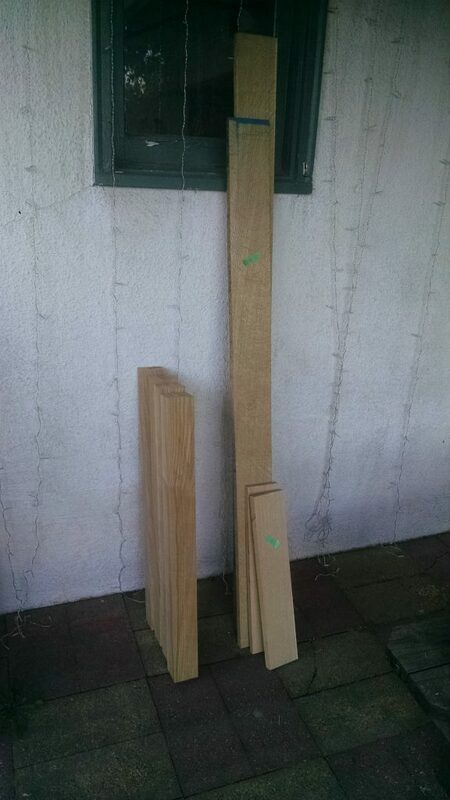 The shelf is also quartersawn white oak (except the center piece which is plainsawn and is an accent and definitely not because I grabbed from the wrong pile at the lumber yard). 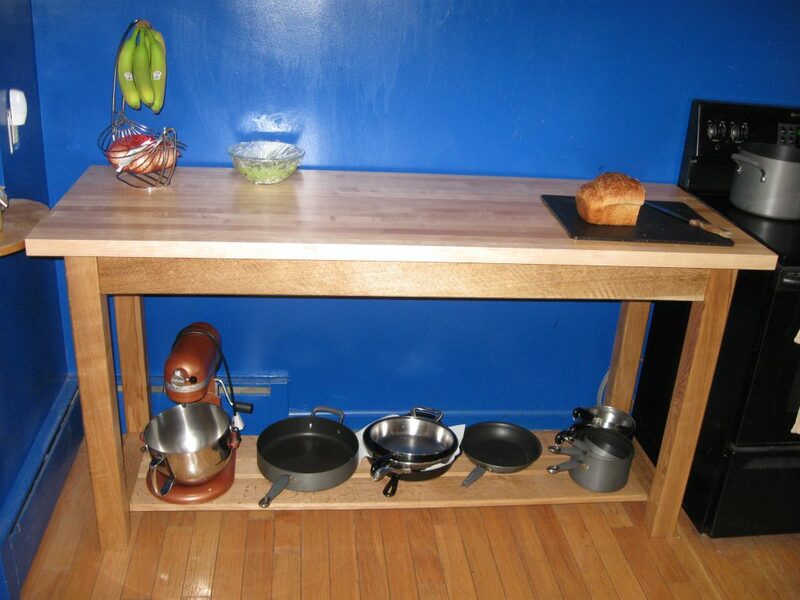 Floor to top, the table is 36 inches high. The top is 70 inches long and 25 inches deep. I purchased the top pre-made from Michigan Maple via my lumber yard, since I didn’t have the confidence to build a nice flat surface that size with hand tools. After completing this project, I think I might be able to try it in the future. 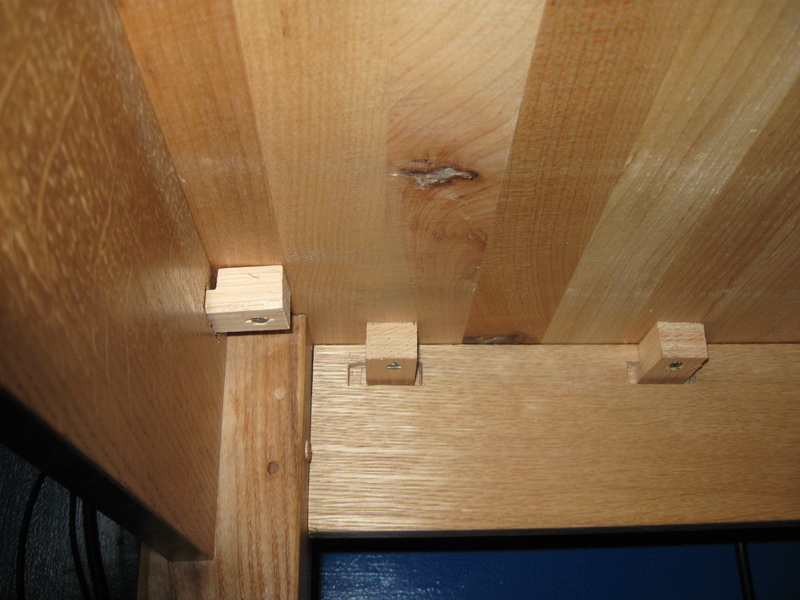 The joinery is all mortise and tenon. 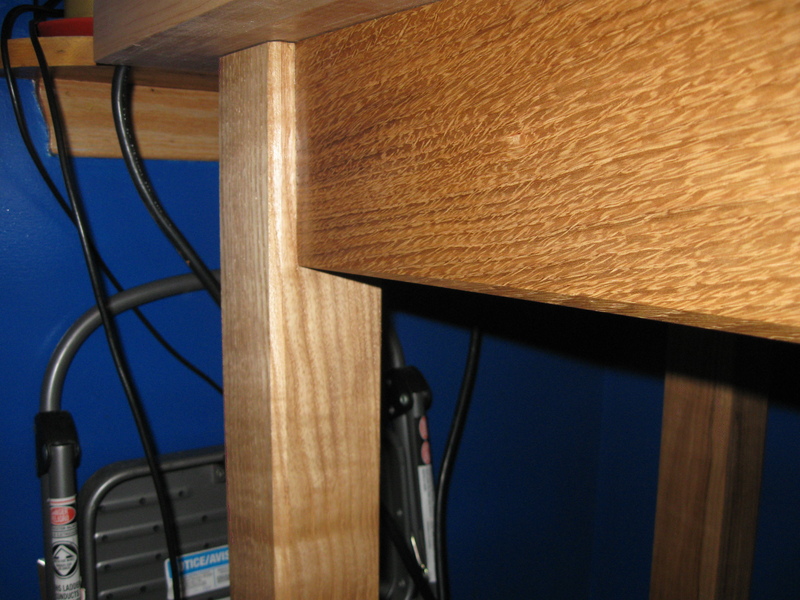 The lower stretcher, for the shelf, was double tenoned to increase the vertical grain surface. 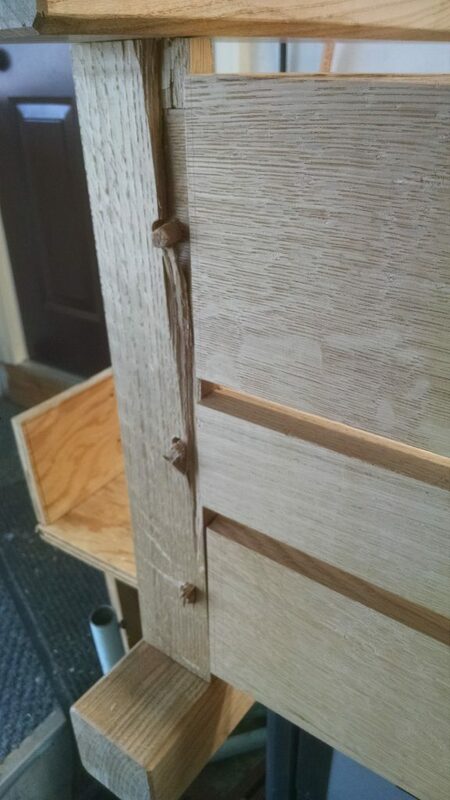 Most of the mortises were chopped out with a mortising chisel, but I also tried a bit brace to pull out most of the material on the deep shelf joints. 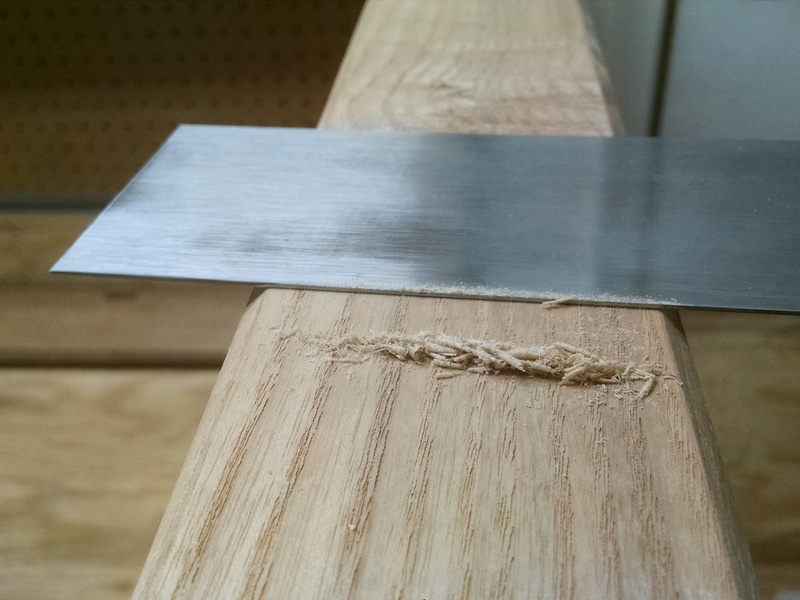 I didn’t time it, but including time to clean up the edges of the mortise, it seemed to take about the same amount of time as the chisel. But it was much less physically exhausting, which meant I could keep up the pace for longer. I chose to drawbore all of the mortise and tenon joints, mostly for strength but also because I don’t have clamps long enough to span the width of the table. Drawboring will draw the joint together without clamps. Since this was my first time drawboring, I did a practice joint, without glue. I actually still have this test joint in my garage. Every now and then I try to pull it apart, but it’s solid, even with the thin pegs and without glue. I don’t have much experience with details, so I chose to do something simple on the edges. All parts of the frame have a consistent width facet which tapers to nothing as the board reaches the joints. The legs have the same facet along the full height. To make the facets taper, after marking the depth of the facet with a marking gauge, I started with a No 5 plane to shape most of the facet. However, I never let the cut start until a few inches from the end. Then I switched down to a No 4 to get a little closer to the edges, then down to my block plane to finish tapering. Because the cut never touched the corners, this provided a smooth taper as the plane angle changed while traveling into the existing facet. The progressively smaller planes led to sharper angles. After everything was glued up, I went over it with a card scraper. In retrospect, I should have done this before glue up. But I was still learning how to use a scraper, so I wasn’t sure I would even use it. Once I got the hang of it, I found it very effective at cleaning up tool marks and at least smoothing over rough grain, if not fixing it up entirely. At this point, I leveled the frame in our kitchen. Then the frame was finished with Emmet’s Good Stuff. The lumber yard recommended it; it’s food safe and water resistant, which is perfect for a kitchen table. The top is attached with buttons made from some scrap pine. I followed the instructions from The Essential Woodworker to size and cut the buttons. 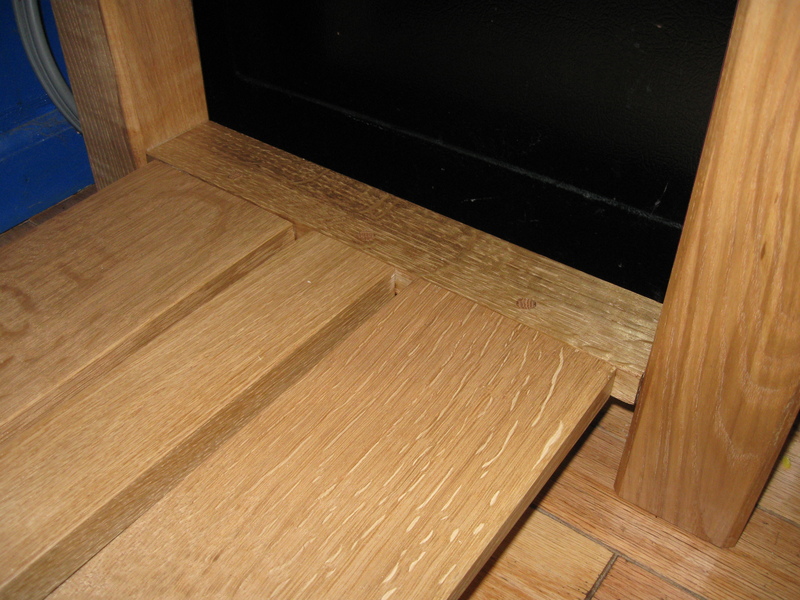 The mortises in the rail were 1/2″ tall and about 3/8″ deep and chopped with a bench chisel. I did hit one big “oops”. The drawbore offsets on the shelf were far too large. 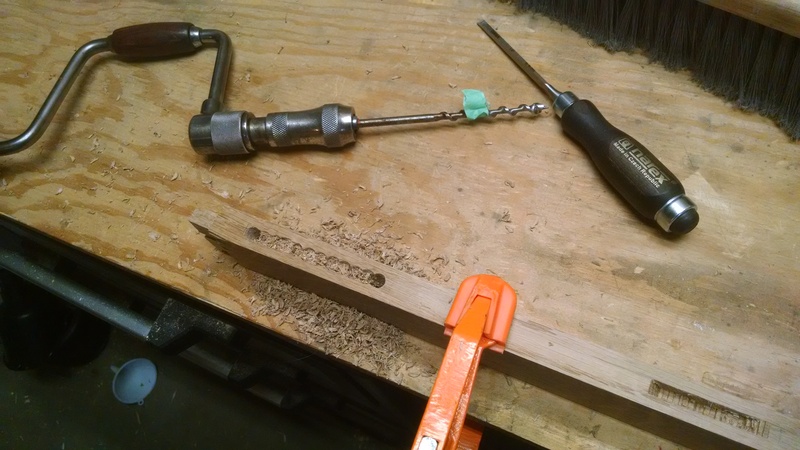 This ended up causing the bottom of one of the shelf stretchers to splinter while I was pounding the pegs in. 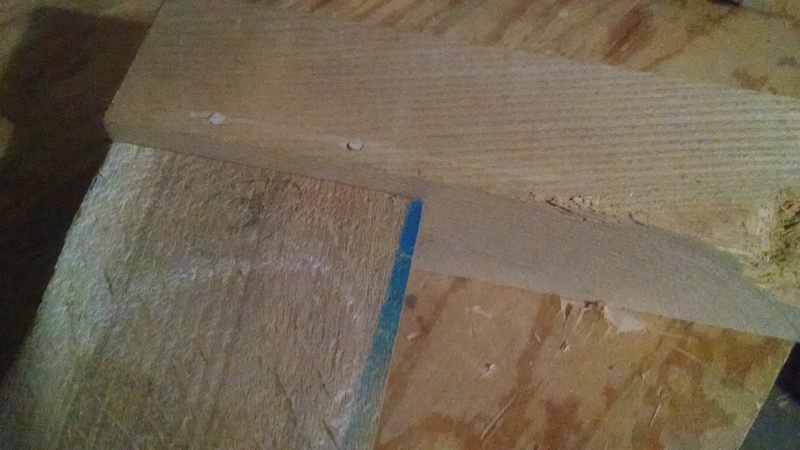 I didn’t measure the offsets while drilling, I just eyeballed it, and it looks like my offsets were between 1/16″ and 1/8″. Far too large, as this made the offset in the 2nd stretcher almost 1/4″, hence the splintering. But it’s on the underside and isn’t visible from any reasonable angle, so it didn’t really impact the final project. Live and learn. And that’s my kitchen counter table. Definitely my largest and most complex, and best executed, project to date. 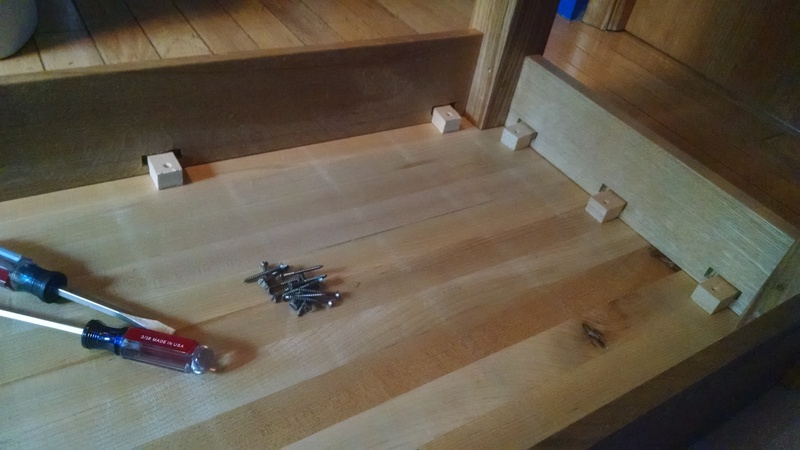 Next up… a proper workbench. You can get in-progress pictures of my projects by following me on Instagram or on Twitter.